A political prisoner in a South American dictatorship escapes and is pursued throughout the country by a bloodthirsty dog. An evil witch seeks a magic ring which is currently in the possession of a mustachieod disciple of black magic. Meanwhile a snake monster terrorizes the city of Hong Kong. A woman tries to attract her reincarnated lover from her previous life but eventually turns to the aid of an evil sorcerer who rules over a tribe of cannibal midgets. A man called Arístides Ungria (Jason Miller) escaping from his imprisonment in a South American dictatorship , pursued by the Beast that will haunt him and destroy those around him until he ultimately confronts his destiny at a deadly duel . 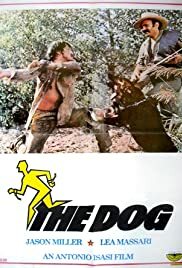 The desperate fugitive chased by a cruel warden (Francisco Casares) defends himself against the nasty dog that is severely beaten , running from the past , pursued by a cruel animal , the beast that stops at nothing to carry out the order to kill . Aristides hits strongly the dog (a well trained and non-mistreated German Shepherd) and is left for dead but comes back ever stronger , with long fangs and jaws and a single-minded bloodlust . The protagonist goes home living a woman (Yolanda Farr) and her daughter and the dog continues attacking , but circumstance again gives him an opportunity for freedom , which he takes , solely he still encounters himself being pursued by the terrible animal . The dog goes after him and will cross hundred miles to get to him . Aristides attempts to arrive the city where thinks encounter his sweetheart named Muriel (Lea Massari , this role was firstly offered Jean Seberg but she turned it down , that's why the looking for a dog took long time) . Meanwhile , he recalls his past on relationship with her and to getaway he disguises as a priest (like in ¨The Exorcist¨ starred by Miller as the exorcist reverend and directed by Friedkin) . He travels across a desolate landscape to the big town in search of his wife , being relentlessly chased by a doomed dog possessed of an ancient evil that will not die until it has devoured the heart and possessed the soul of its prey . Arístides Ungria is helped by the besieged resistance formed by a brave group of freedom fighters (Marisa Paredes , Antonio Mayans , José Vivó , Manuel De Blas) . Finally , Ungria will confront a heinous officer (Aldo Sambrell) and the gruesome dog . This is a moving story about pursuits , including a political denounce about South American dictatorships ; dealing with a violent tale of a convict on the run , a prisoner in South America who manages to escape and is chased throughout the country by a bloodthirsty dog . A chase across a landscape of terror where there is no friend , no refuge , no respite from merciless violence and cruelty , there is only the hunter and the hunted . Jason Miller stars as the hapless prisoner , he is acceptable and his action scenes are well played . The mythic secondary from Spaghetti Western , Aldo Sambrell , is good as the sadistic villainous , as always . The structure film is pretty plain and simple , but concerns about the relentless pursuit and fighting among a fugitive and a savage dog following his footsteps . This first version develops a political intrigue with dictatorship , a dictator called Leónidas , included a resounding message . Atmospheric cinematography by Juán Gelpi , shot on location in hydraulics constructions as Bolarque , Entrepeñas , Buendía , Ataza and Madrid and Miranda , Caracas , Venezuela . Including a nice cinematographer work , using subjective camera , filmed under dog viewpoint . Adequate and suspenseful musical score by Antón Garcia Abril who formerly composed the famous soundtrack of the ¨Templar Zombies¨ films directed by Amando De Ossorio . And adding a wonderful song sung by Angela Carrasco . The picture is based on a novel with same title by successful Spanish author , an adventure expert and prolific author called Alberto Vazquez Figueroa who gets numerous cinematic adaptations , such as : ¨Manaos¨ , ¨The Iguana¨ , ¨Ocean¨ , ¨The Last Harem¨, ¨Oro Rojo¨ , ¨El Perro¨ and ¨Rottweiler¨ . As it was remade in 2004 as ¨Rottweiler¨ with similar plot , as political prisoner in a dictatorship escapes and is pursued throughout the country by a bloodthirsty dog reinforced with modern technology . This new adaptation is an extremely violent film with noisy action , stirring thriller and lots of blood and gore . Being directed by Brian Yuzna and stars William Miller , Irene Montalà , Paulina Gálvez , Lluís Homar and Paul Naschy . The director was defending his name and career , but also his money in more ways than one , as he was one of the producers investing in the project and it achieved a big hit smash at Spanish box office . Antonio Isasi Isasmendi is a good professional , a craftsman who has directed several films in diverse genres , as adventures and , especially , action , such as : ¨The dog¨ 1979 , 1972 ¨Summertime Killer¨ , 1968 ¨Las Vegas, 500 millions¨ , 1963 ¨The mask of Scaramouche¨ , 1958 ¨Rapsodia De Sangre¨ . "El Perro¨ results to be a surprisingly solid little film , including some action scenes very skillfully staged . Decent action/thriller is worth trying . This is a movie that's both entertaining and enlightening . Certainly worth watching if you're in the mood for something other than typical exploitation fare .